How Insensitive (Insensatez in Portuguese) is a bossa nova classic written by Antonio Carlos Jobim. In this lesson, you will learn how to play the melody of How Insensitive, how to solo over its chord changes, and you will have a look at some typical bossa nova intros. How insensitive has been recorded by a lot of musicians, including Joao Gilberto, Stan Getz, Oscar Peterson, Charlie Byrd, Chet Atkins, Frank Sinatra, Ella Fitzgerald, Emily Remler, Bireli Lagrene, Sting, Iggy Pop, and many more. The most notable jazz guitar versions are those of Wes Montgomery, Pat Martino, and Pat Metheny, especially his live version of 1993, which you can see below. How Insensitive was Jobim’s homage to Frédéric Chopin. The song resembles Chopin’s Prelude, Op. 28 (No. 4), in harmony as well as melody, as you can hear below. Here is the melody of How Insensitive, arranged in a way you would play it in a jazz trio with drum and bass. I harmonized the melody sparingly in order to get a clear distinction between the melody and the accompaniment. Bar 3: diminished chord with a b13. This voicing is like a (C) 13th chord with a raised root or an (F#) 7#9 chord with the 5th in the bass. Bar 7: the first chord is a Dm6 shape, a substitute for Bm7b5. Bar 9-10: the accompaniment goes from Bbmaj7 to Bb6/9. Bar 11-12: the same thing as above, the chords go from Ebmaj7 to Eb6/9. Bar 16-20: some octaves and chords à la Wes Montgomery. Bar 23: I play the vanilla Dm here without the 7. How Insensitive is in the key of D minor and has 32 bars which you can see as 4 blocks of 8 bars. The harmony of How Insensitive is not very straight-forward and not everybody agrees on which chord to use where. Especially the first 8 bars can be daunting to improvise over in the beginning. 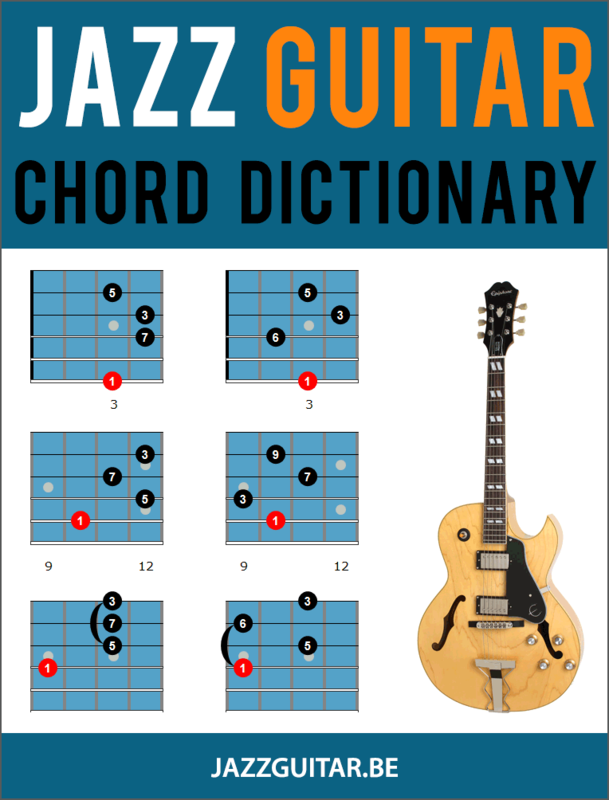 Here’s a scale analysis of the chord changes. How Insensitive starts on the tonic minor chord, Dm7. 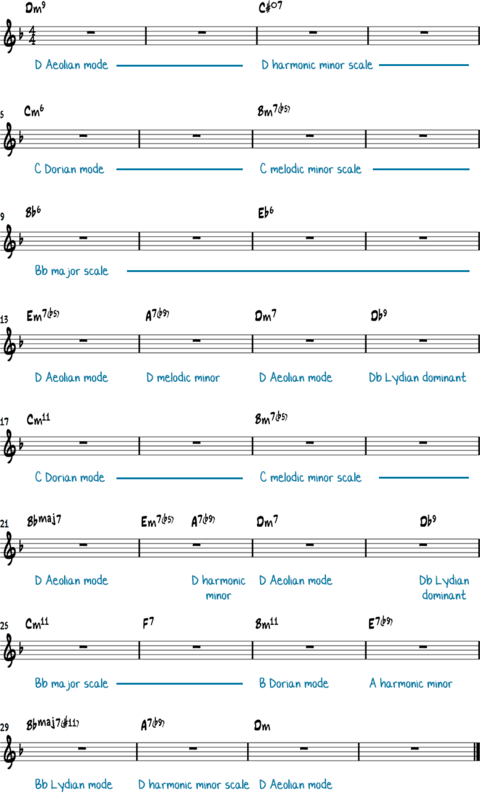 The obvious scale to play here is D Aeolian (=D natural minor scale), but you can also use the D minor pentatonic scale or the D minor blues scale. The next chord is a C#dim7, which can also be seen as an A7b9/C#, the first inversion of A7. This is a chord a lot of people have troubles improvising over. The scale of choice here is the D harmonic minor scale, but you can also use the D minor pentatonic or blues scale. On the Cm6, you play the C Dorian scale (the second of the guitar modes). The Bm7b5 in bars 8 and 9 can also be seen as a G7/B. The scale of choice here is the C melodic minor scale. Here are some intros in the bossa nova style you can use for How Insensitive. Most of these intros end on A7 (the dominant chord of Dm7) to make a smooth transition to the first chord of How Insensitive. This intro is in D major. The major tonality of the intro emphasizes the minor tonality of How Insensitive and makes a nice contrast. Thanks so much, I feel Remler’s version should included with greats as well. What a superb gift to readers you have given with the Jobim. Thank you for posting this detailed jazz exposition. Your willingness to freely share your art is much appreciated.